indicated for hypercholesterolaemia and hyperlipidaemia. The result of many years’ research, our new dietary supplement Pantesin™ is formulated from pantethine, a derivative of vitamin B5. Also known as bis-pantethine or as the brand name Pantesin™, pantethine is a combination of two molecules of pantothenic acid which is actually another name for vitamin B5, a water-soluble B complex vitamin known for its role as a precursor of coenzyme A. In other words, pantothenic acid or vitamin B5 participates in the structure of coenzyme A, a substance involved in several of the body’s essential functions. Though coenzyme A is often mentioned for its anti-stress virtues, it is also essential for the synthesis and metabolism of proteins, carbohydrates and fats. Vitamin B5 has thus generated interest among the scientific community for its multiple benefits and its potential to combat excess lipids in the blood, a major concern given that hyperlipidaemia may be linked to health complications such as hypercholesterolaemia which is itself responsible for certain cardiovascular problems. Studies conducted on vitamin B5 have led scientists towards one of its natural metabolites: pantethine. Considered by some to be the more active form of vitamin B5, pantethine has proved particularly beneficial for combatting excessive blood lipids and cholesterol. Such studies have formed the basis of our supplement Pantesin™. Produced from a form of pantethine, this new product is thus specifically indicated for tackling hypercholesterolaemia and hyperlipidaemia. This unprecedented formulation is the result of more than 35 years’ research, including several years of clinical studies conducted in North America and Asia. Such research has demonstrated excellent results for cardiovascular health. The scientists responsible for these studies have concluded that this specific form of vitamin B5 may help increase the activity of coenzyme A (CoA), which may in turn improve the lipid profile by maintaining cholesterol and triglyceride levels within the normal range. This is particularly encouraging given that excessive cholesterol and triglycerides can affect the circulation and cause cardiovascular problems such as atherosclerosis, heart attacks and stroke. A vitamin B5 metabolite, pantethine represents a natural and effective solution for combatting excessive triglycerides and ‘bad’ LDL-cholesterol. Its effect may be even more beneficial as pantethine potentially increases levels of ‘good’ HDL-cholesterol too. As a result, some scientists consider it a safe and natural alternative to statins. These are cholesterol-lowering drugs used to treat hypercholesterolaemia but their use is sometimes seen as controversial due to their side-effects and contraindications. 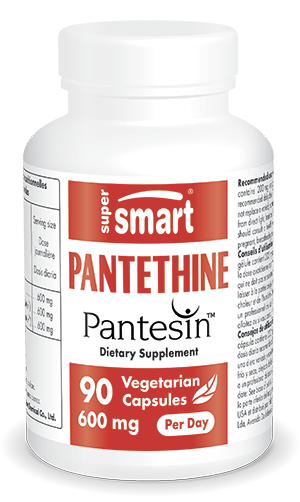 Our new supplement Pantesin™ offers the natural, recognised activity of pantethine. Other natural products have also been shown to reduce ‘bad’ cholesterol, including policosanol extract, which inhibits production of cholesterol by the liver. Widely-studied in recent years, omega 3 fatty acids are also recognised for their beneficial effects against hypercholesterolaemia and hyperlipidaemia. Pantesin™ is a registered trademark of Kyowa Pharma Chemical Co., Ltd.
Each capsule contains 200mg of pantethine.